All proceeds benefit the American Cancer Society's Relay for Life. Relay for Life is an incredible organization that has raised millions of dollars to fight against cancer since 1985! Jerry's Wish, founded in 2008, is one of many teams that work countless hours all year to collect as much as possible! For more information, or to join in the fight, just click the Relay for Life logo! 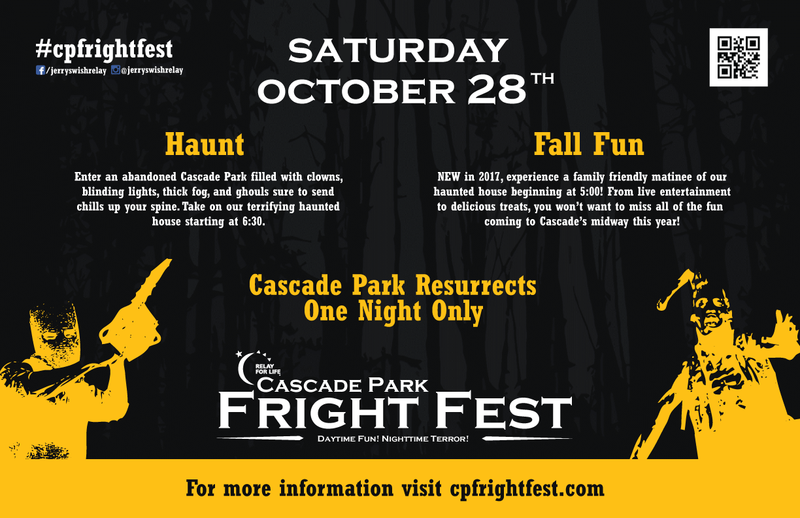 sponsoring the Fright Fest event please fill out this application. We are also looking for donations of any kind! All donors will be listed on our patron board within Cascade Park. To donate please fill out this sheet. Both can be mailed to Jerry's Wish at 1420 Fletcher Hill Road Wampum, PA 16157. eMail us with any questions at jerryswishteam@gmail.com! We greatly appreciate any donation!